We enjoyed our well-earned dinner and had a look around. 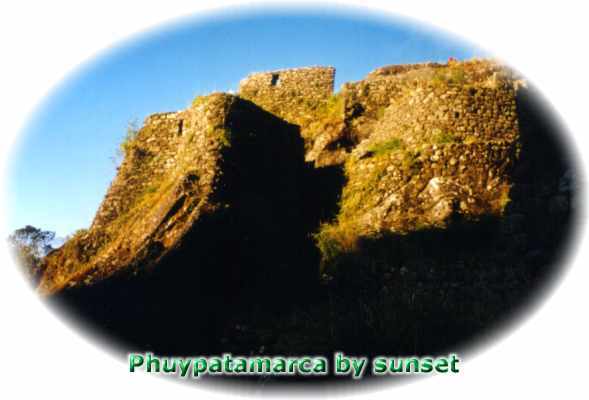 We could easily survey the city of Phuyupatamarca, the summit of the Machu Picchu Mountain and the two ruins Intipata and Wi�awayna (usually translated as 'forever young'). On top of the mountain where we slept were the ruins visible of an ancient observation post. 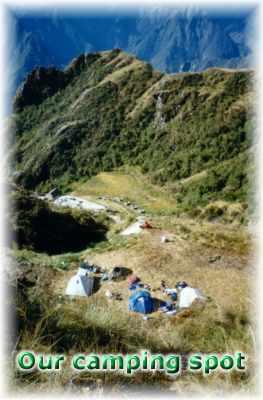 We climbed to the summit and were astonished by the spectacular view over ruins, snowy mountains of over 6000m and the subtropical rain forest. It is the perfect contemplation spot. Before sunset we went downstairs to the ruin of Phuyupatamarca to purify water for the next day. An underground river irrigates ceremonial baths. The highest part of the settlement is the temple of the Sun, an open-air construction. We enjoyed the sunset and walked around the small city. Phuyupatamarca is bigger than it seems. Terraces surround the place and a few hundreds of people could have lived there. Again we say this perfect union of strategy, ethics and religion. 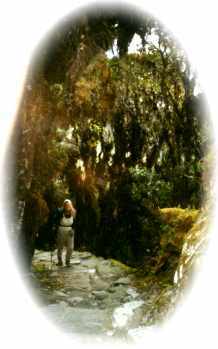 As the place is called 'town above the clouds', the clouds formed in the valleys of the cloud forest are already dissolved at this height. The sky became very red as the Sun disappeared behind the Machu Picchu Mountain. 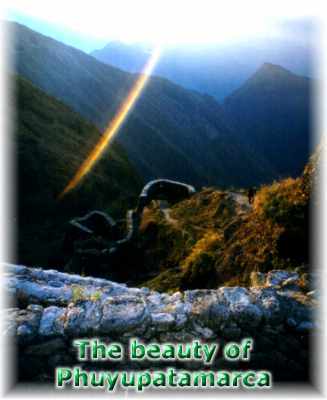 The Cordillera Vilcabamba reflected the red Sun beautifully all over this surrealistic view. Tens of humming birds were chasing insects.